131 fewer beds per 100,000 persons. A reduction by between 1 and 2 hospitals providing MRI services per 500,000 persons. A reduction of 37 percent in the number of hospitals offering CT scans. As these maps show, the first state to institute a CON program was New York in 1964, followed by Rhode Island, Maryland, California, and 20 other states over the next 10 years. 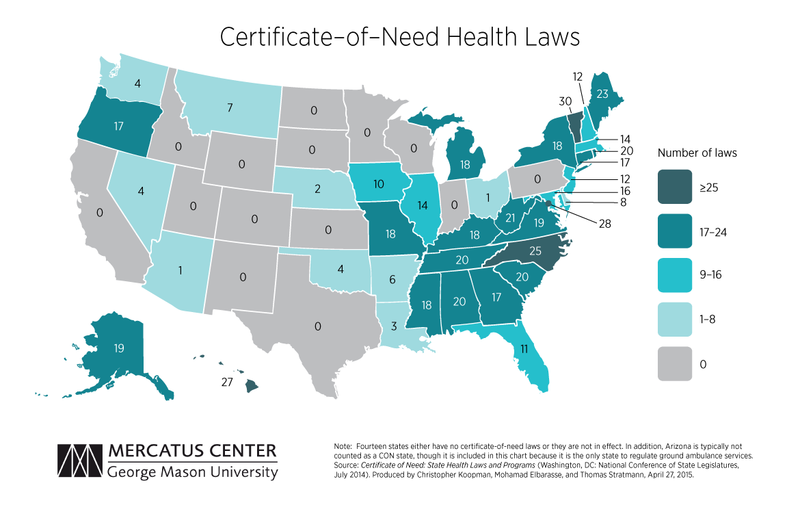 In 1974, Congress passed the National Health Planning and Resources Development Act, requiring states to implement CON requirements in order to receive funding through certain federal programs. Louisiana was the only state not to implement a CON program during this time. In 1987, the federal government repealed the CON mandate, and throughout the 1980s, states began retiring their CON programs. By 1990, Arizona, California, Colorado, Idaho, Kansas, Minnesota, New Mexico, South Dakota, Texas, Utah, Wisconsin, and Wyoming (a total of 12 states) repealed their CON programs. This left 38 states and the District of Columbia with these laws, although Wisconsin reinstated their program in 1993. By 2000, Indiana, North Dakota, and Pennsylvania had repealed their programs. This brought the number of states with CON programs to 36 (and DC). 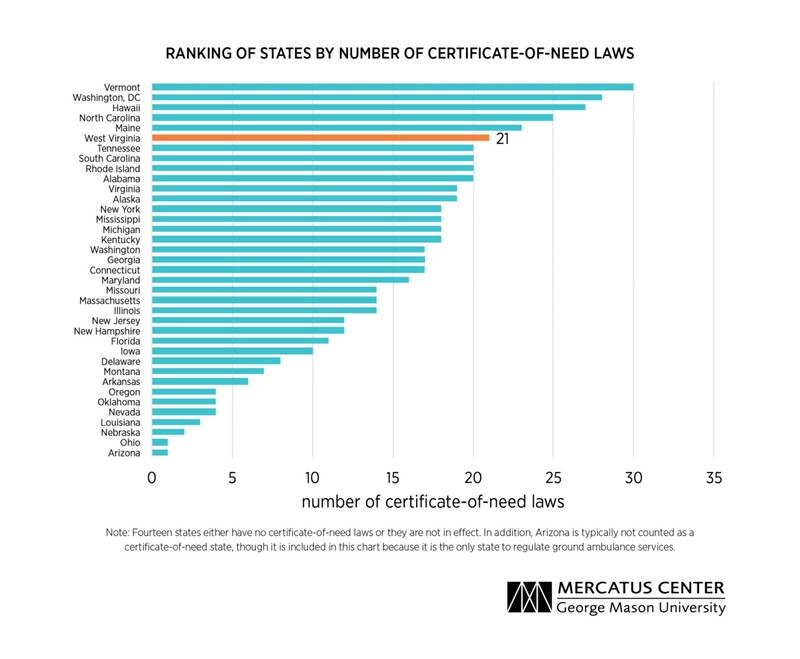 Since 2000, Wisconsin is the only state to repeal its program. In states such as Arkansas that restrict hospitals’ capital expenditures (above a certain threshold) on MRI machines and other equipment, the number of hospitals that offer MRIs is reduced by between one and two per 500,000 persons. This could mean between 6 and 12 fewer hospitals offering MRI services throughout Arkansas. 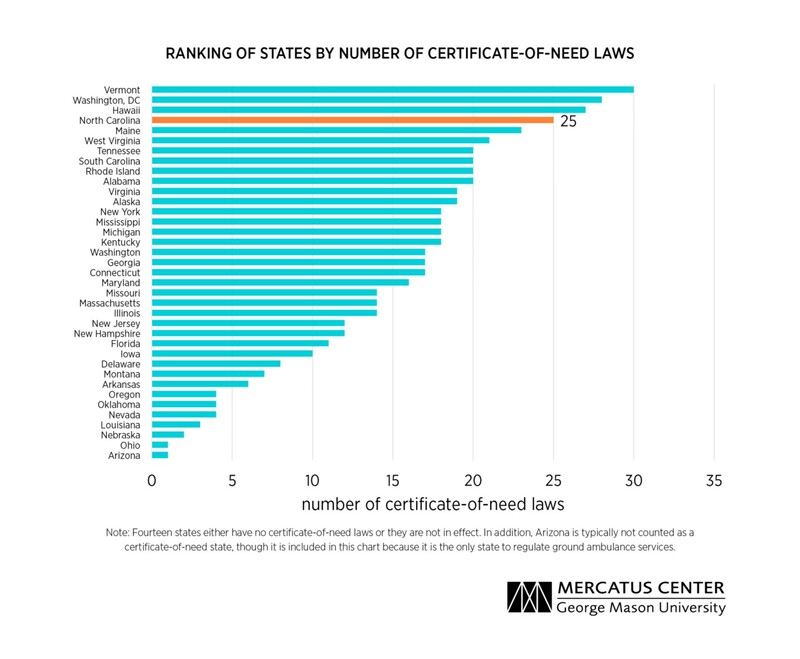 The state’s CON program also affects the availability of CT services. 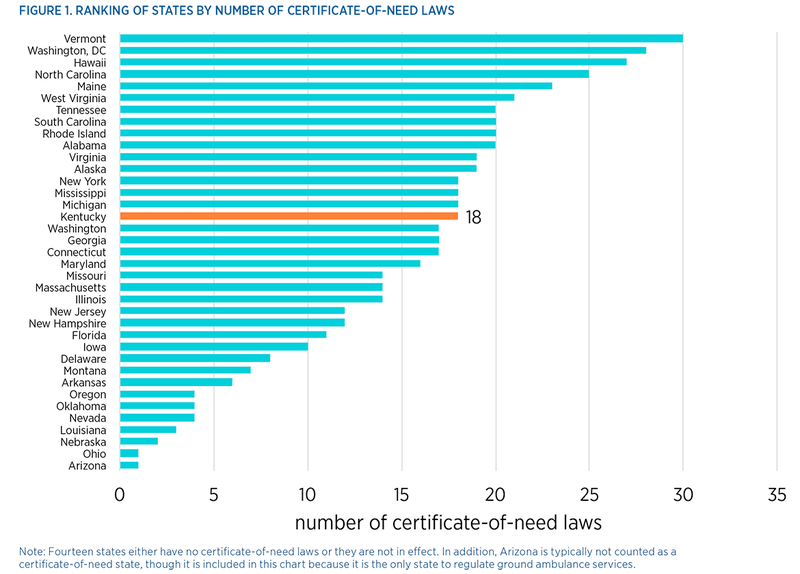 While an average of nine hospitals per 500,000 persons offer CT scans, CON regulations are associated with a 37 percent decrease in these services. For Arkansas, this could mean between 15 and 21 fewer hospitals offering CT scans. Click here to learn more about CON laws in Arkansas. For residents of Miami-Dade County (Florida’s most populous county), CON programs result in approximately 3,428 fewer hospital beds, between 5 and 10 fewer hospitals offering MRI services, and 18 fewer hospitals offering CT scans. Click here to learn more about CON laws in Florida. CON programs in Georgia could mean approximately 13,227 fewer hospital beds, between 20 and 40 fewer hospitals offering MRI services, and between 50 and 71 fewer hospitals offering CT scans. Click here to learn more about CON laws in Georgia. 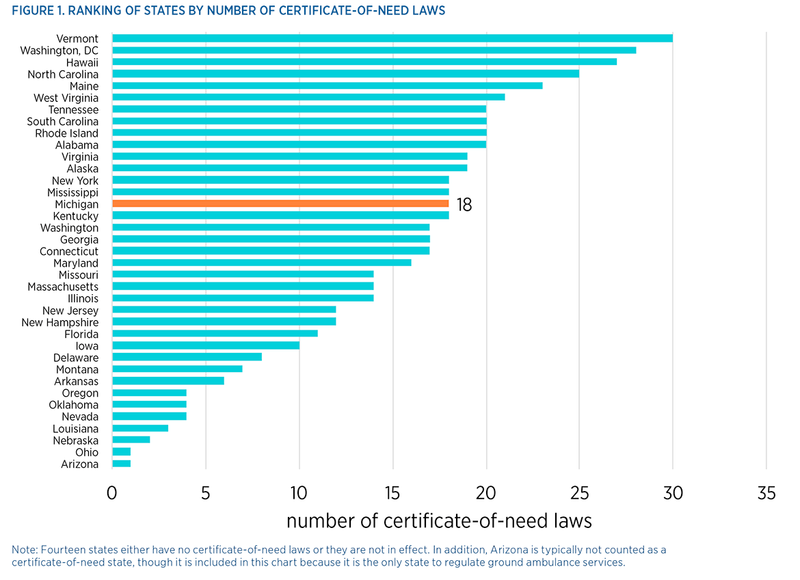 In states where CON programs regulate acute hospital beds, Stratmann and Russ find 131 fewer beds per 100,000 persons. In the case of Kentucky, with its population of approximately 4.4 million, this could mean about 5,782 fewer hospital beds throughout the state as a result of its CON program. Click here to learn more about CON laws in Kentucky. Throughout the United States there are approximately 362 beds per 100,000 persons. However, in states such as Michigan that regulate acute hospital beds through their CON programs, Stratmann and Russ find 131 fewer beds per 100,000 persons. In the case of Michigan, with its population of approximately 9.9 million, this could mean about 12,982 fewer hospital beds throughout the state as a result of its CON program. Click here to learn more about CON laws in Michigan. For Missouri these programs could mean approximately 7,943 fewer hospital beds, between 12 and 24 fewer hospitals offering MRI services, and between 41 and 52 fewer hospitals offering CT scans. For those seeking quality health care throughout Missouri, this means less competition and fewer choices, without increased access to care for the poor. Click here to learn more about CON laws in Missouri. In New Hampshire CON programs result in approximately 1,300 fewer hospital beds, 7 fewer hospitals offering MRI services, and 9 fewer hospitals offering CT scans. For those seeking quality health care in New Hampshire, this means less competition and fewer choices, without increased access to care for the poor. Click here to learn more about CON laws in New Hampshire. Click here to read Mercatus research fellow Christopher Koopman’s testimony to the New Hampshire House Health, Human Services, and Elderly Affairs Committee. For North Carolina these programs could mean approximately 12,900 fewer hospital beds, 49 fewer hospitals oﬀering MRI services, and 67 fewer hospitals oﬀering CT scans. Click here to learn more about CON laws in North Carolina. In the case of South Carolina, with its population of approximately 4.8 million, this could mean about 6,331 fewer hospital beds throughout the state as a result of its CON program. This could mean between 10 and 19 fewer hospitals offering MRI services throughout South Carolina. For South Carolina, this could mean between 33 and 41 fewer hospitals offering CT scans. Click here to learn more about CON laws in South Carolina. For those in Tennessee, CON programs could mean approximately 8,500 fewer hospital beds, 32 fewer hospitals oﬀering MRI services, and 45 fewer hospitals oﬀering CT scans. For those seeking quality health care in Tennessee, this means less competition and fewer choices, without increased access to care for the poor. Click here to learn more about CON laws in Tennessee. For Virginia CON programs could mean approximately 10,800 fewer hospital beds, 41 fewer hospitals offering MRI services, and 58 fewer hospitals oﬀering CT scans. Click here to learn more about CON laws in Virginia. In the case of West Virginia, with its population of approximately 1.9 million, CON programs could mean about 2,424 fewer hospital beds throughout the state as a result of its CON program. Click here to learn more about CON laws in West Virginia.